Unplanned development and lack of fire safety measures in markets, residential buildings and hospitals have been posing a great risk of casualty in fire accident in the port city, thanks to indifference by the owners and authorities concerned. 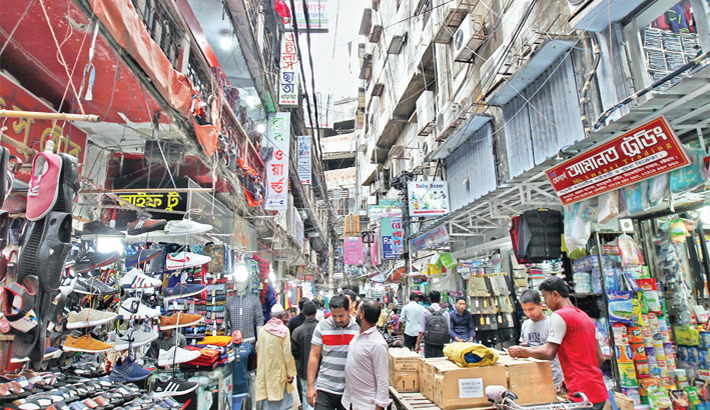 A recent survey conducted by the Fire Service and Civil Defence (FSCD) department on some establishments revealed that 41 establishments of different densely populated areas including Reazuddin Bazar, Khatunganj and Asadganj are in the risk of fire accident. Besides, 97 per cent hospitals and 70 per cent high-rise buildings also lack fire safety measures, said Assistant Director (AD) Jasim Uddin of the FSCD quoting the survey. The issue came to focus again after a deadly fire claimed at least 68 lives and injured a good number of people at Chawk Bazar in the capital on February 20. Three days before the fire accident, nine people were also burnt alive in a devastating slum fire in the port city’s Bera Market area on February 17. Concerned officials blamed unplanned urbanisation without keeping sufficient passage for movement of fire fighting vehicles and easy access to water, narrow alleys and callousness among the building owners in keeping sufficient fire safety measures for losses of lives and properties in fire incidents. They said many places in the port city were developed in such a way that fire fighting units can’t enter there where overhead electric wires also seriously hamper smooth operation of fire fighting. Sources said over 60 lakh people live in the city and the number is increasing day by day. To cope with the growing number of people, many markets, residential buildings, shopping malls and hospitals were developed in different areas. Many of them were developed defying the fire safety rules while it is mandatory to obtain license from fire department for developing any commercial and residential building over six-storey, said the sources. The markets at risk in the city include Reazuddin Bazar, Tamakumandi Lane, Jahur Hawkers’ Market, Terri Bazar, wholesale markets in Khatunganj, Chaktai and Asadganj and Singapore Bangkok Market at Chhotopole, they said. Of the markets, Reazuddin Bazar, Tamakumandi Lane, Jahur Hawkers’ Market and Terri Bazar lie in worst condition with thousands of buildings and shops developed there in a most unplanned way. The FSCD AD Jasim said though they are now sufficiently equipped narrow roads and lack of water source stand on way of quick control of fire. The markets lack sufficient passage for movement of sophisticated long and high fire fighting vehicles or provisions for easy access to water reservoir, he said. Traffic jam and overhead wires are also major elements that hinder combating fire incidents easily, observed the AD. “If any fire breaks out in the risky areas the losses of human life and property will be unpredictable,” he feared. Despite the fire accidents taking place frequently many owners are reluctant to ensure fire safety measures at their establishments, said the AD adding that electric short-circuits from electric wires and machineries is the main cause of most of the fire incidents. “We are carrying out drives through mobile court and awarding financial penalty to compel different establishments to maintain fire safety measures,” he said. People usually get panicked and run away instead of trying to douse fire at initial stage. It becomes tough to douse the blaze when it spreads before the firemen reach the spot, he added. Contacted, Tamakumandi Lane Bank Samity General Secretary Ahmed Kabir Dulal admitted that there are huge godowns stored highly combustible products in the markets. “We have started campaign through miking and distributing leaflets to aware the shop owners to avert the recurrence of any deadly fire like Chawk Bazar,” he said. “We are asking the shop owners to carry out proper maintenance of their electric wires and shift the godowns of combustible products from the market,” said Kabir. Besides, they were asked to keep fire extinguisher at every shop to tackle fire incident initially, he said. “We also have held meeting with the FSCD officials and are carrying out the campaign as per their suggestions,” added the general secretary.